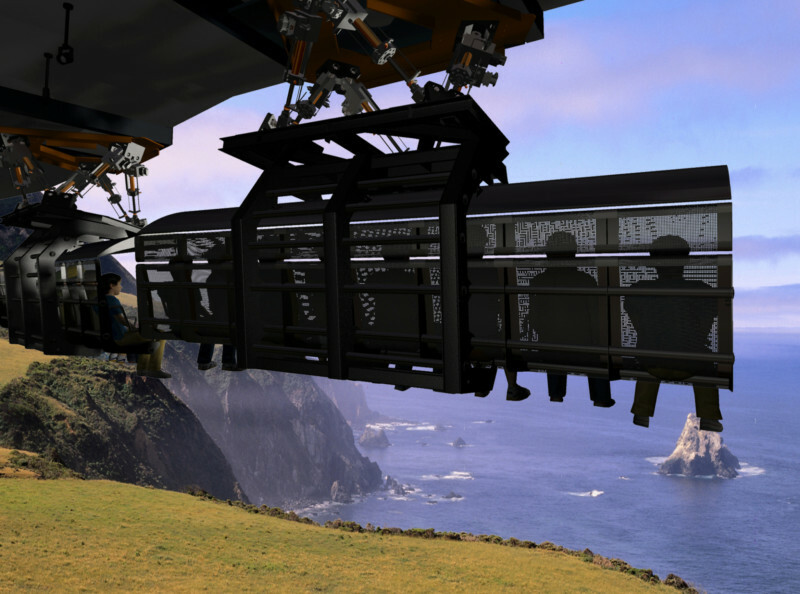 FlyOver Canada is a next-generation flying/gliding, media-based motion attraction in the style of Soarin’. What are the key elements that make this experience distinct from earlier genres of motion theater such as represented by Star Tours and Back to the Future – The Ride? With rides like Star Tours, the idea is that you’re in a vehicle. You view the world through a window while moving through an environment. In contrast, FlyOver Canada gives you the opportunity to look around the world you are flying across, without the intermediary of a vehicle. The experience is much more like that of a bird flying forward and moving around as it flies – or like being Peter Pan – which was in fact much of the inspiration for me. Guests can move their head to view the world around them much like a bird while the sensation of surrounding motion is created by our camera, attached by a gyro mount to the helicopter. In terms of technology and technical design, how would you compare Soarin’ and FlyOver Canada? Here are some of the similarities. Guests view a dome- based experience while suspended in nine, open-air, flying vehicles. The orientation of the guest in relation to the dome screen, the idea of having image below you, to the side, in front of you, and somewhat truncated at the top are all quite similar. Now for the important differences. What distinguishes FlyOver first is that the production is all-digital. Soarin’ was shot on film in the IMAX 15 perforation/70mm format; we filmed and projected at 48 frames per second (fps). FlyOver was captured and is presented digitally; shot and projected in 4K digital at 60 fps. With high resolution and higher frame rate, it’s like watching 3D without glasses. The closest objects we captured in FlyOver are probably 15-20 feet from you, but for the most part, everything’s beyond the surface of the screen, out beyond 30 feet in the actual shot, which is past the projection surface of the dome from the guest’s eye. Everything you look at feels natural and real with appropriate parallax. Being able to experience this attraction with no glasses also adds to the sense of reality, given we have added effects like mist and wind. You also recently worked on a dome with a very different purpose – the Adler Planetarium. What similarities and differences did you find between the Adler and FlyOver Canada? 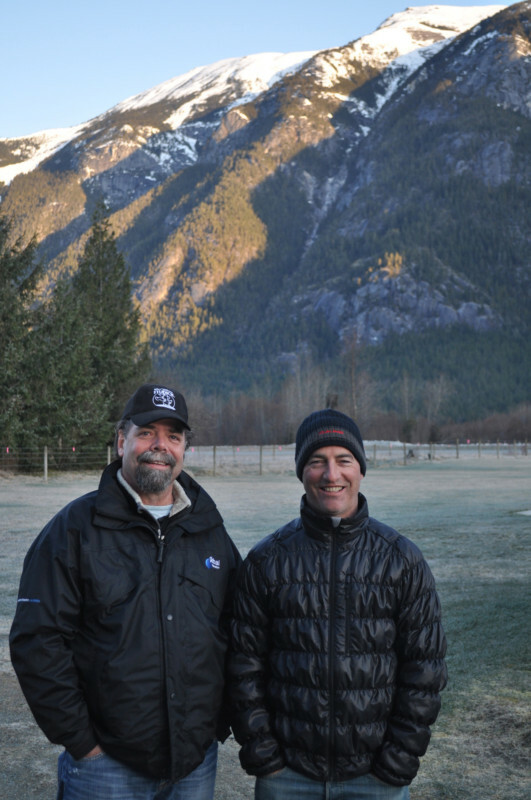 They are two very different kinds of experiences and applications of dome technology. 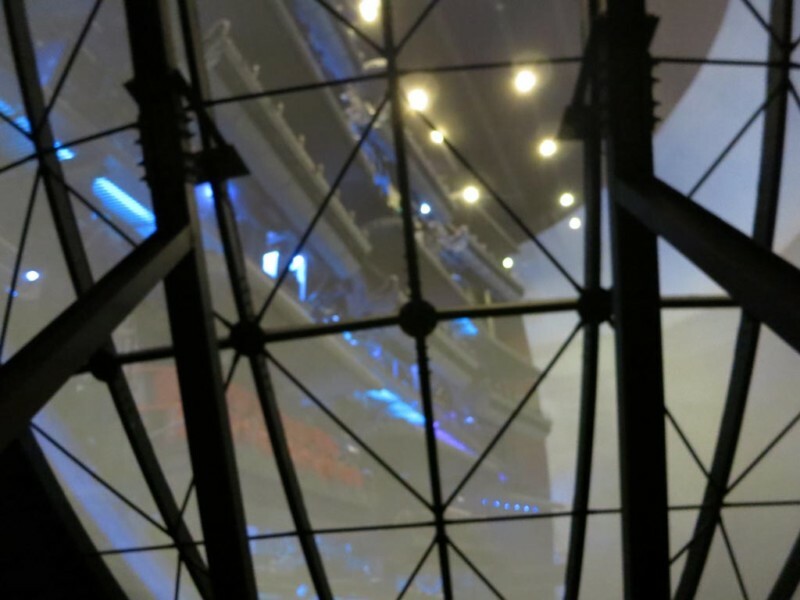 With the Adler, the dome was a fulldome application, with the viewer orientation being from a flat floor, so the principal immersive experience is above and around the viewer. With FlyOver Canada, the dome is a truncated, vertical half-dome, with the view orientation being from a ride seat that suspends the guest directly in front of the dome, providing an immersive experience in front, below and around the viewer. The Adler image is provided with over 20 projectors, tiled together creating the perfect system for extremely high contrast (ultra-black) playback, which is perfect for a deep-space planetarium experience. The FlyOver image is provided with a single projector, avoiding all of the tiling issues, given that it is used to project real world daylight and nighttime images of natural settings, where variation of color, even subtle, that results from tiling would be extremely disruptive to the experience. They really are two very different experiences driven by fundamentally different creative needs. Mostly different, with the exception they both use spherical projection surface to immerse the guests. How do domes, anamorphic screens, and 360 cinema systems affect the public’s perception of a film? First of all, I view these kind of spaces as experiences, rather than films in a traditional sense. Films traditionally can be used to tell lengthy dialogue or narrative intensive stories. The experiences I spend much of my time developing are way less dialog/narrative intensive “stories.” So, with the understanding of that central difference, it is my hope that the with the use of the variety of technologies, the guest can reach a point in their experience when they lose all sense of disbelief and become fully “immersed” in the experience. Clearly, the opportunity of much higher projection and capture frame rate stands out as a most important element in helping to produce this immersive effect with dome experiences that I don’t think are as necessary for much of traditional film/video storytelling. In many cases, having a dome experience without the use of 3D can provide an even more immersive experience than with it. How is FlyOver Canada owned and operated? 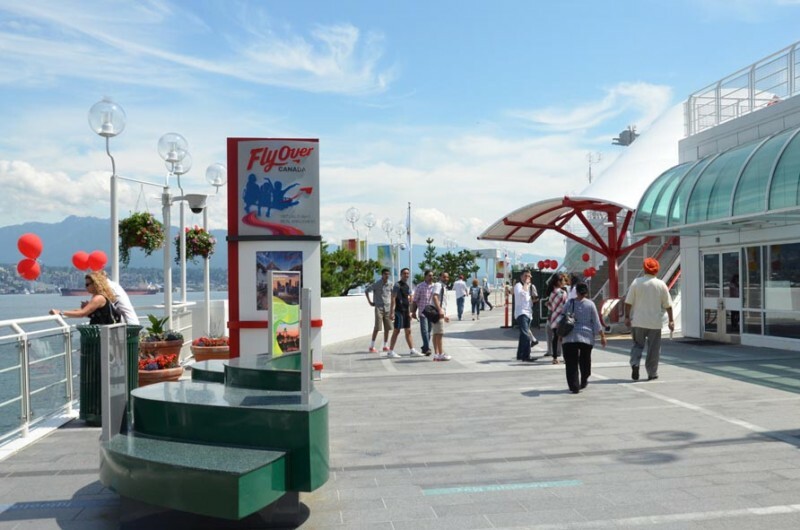 FlyOver is a separately ticketed, standalone attraction in Canada Place in downtown Vancouver. Soaring Attractions is the Canadian entity that created and operates it. The two principals in this company are Stephen Geddes and Andrew Strang. They’re both Canadians and Vancouver residents. Tell us about the ride technology you selected. Brogent Technologies is the manufacturer of the ride vehicle. They have an association with Vekoma, which allows them to leverage Vekoma’s substantial expertise in ride manufacturing as well as its sales and marketing resources. Brogent developed the vehicle on their own, and E-DA park in Southern Taiwan is the site of their first system installation. Brogent, which is also based in Taiwan, has a strong background in advanced flight simulator technology. What were some of the challenges and solutions of retrofitting the building at Canada Place to house FlyOver Canada? Any challenge one faces, whether a blank piece of paper or a preexisting facility, comes with constraints that you begin to work with. In the case of FlyOver Canada, the constraints started with the facility. This was not just a preexisting facility, but a preexisting facility on a large harbor pier several floors above pilings that also support a full convention center that sits directly below the original theater space. So there were both spatial and structural challenges to integrating our dome and ride system. Can you give an example where the immersive technology didn’t work by being detached from the story? I’m not one to publicly criticize others’ work. I will say that there are examples out there where the lack of appropriate coordination and programming of the various technologies used to create immersive experiences aren’t well done, such that there is incongruity between various elements (say motion of a vehicle and motion in the media) that continually disrupts and takes you out of the “reality” of the experience you hope to enjoy. Other elements such as low resolution and dim, low-contrast image will also detract from the experience. The whole trick, if you will, with what we hopefully do in creating immersive stories and experiences is to transport the guest into the created reality we are presenting. How has projection mapping changed the entertainment industry? How do you see immersive media changing the way stories are told in the future?